The Feats of Strength are an integral part of our annual Smugglivus Tradition. In previous years, the Feats of Strength were a challenge in which we dared each other to read a book that we knew was so far beyond the other’s comfort zone as to put it in another galaxy altogether. This year, we changed the rules: we each get to read and review 5 books, in 5 different genres (including one Dare book and one What She Said book) and with the following TWIST: each review can contain no more than 50 words. For people like us whose reviews are generally written with no less than 800 words and often with more than 1000, this is a true Feat of Strength! Today it is Thea’s turn to take on the impossible feat… Eep. 50-word Review: The second book I’ve read from Summers, Cracked up to Be is a painful, impeccably written, character-driven book. Parker is a complicated heroine who feels wholly real; she fronts apathy, but truly is screaming for help. A gutsy & poignant novel that doesn’t pull any punches. 50-word Review: Reminiscent of American Gods & Something Wicked This Way Comes, this is a coming-of-age tale that blends American folklore, history and PURE AWESOMENESS in an epic showdown for the soul of crossroads town Arcana. Natalie is an amazing heroine and I want more please. OMG I LOVED THIS BOOK. Reality TV meets a chillingly realistic version of America—and the fame game is on! 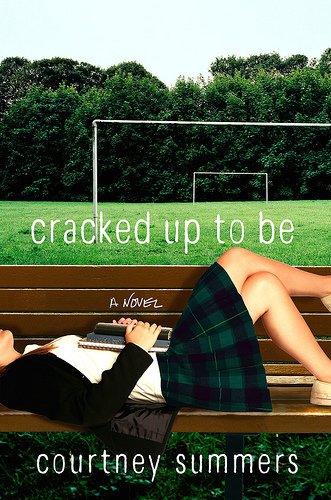 Amy had dreams of going to college, until the Collapse destroyed the economy and her future. Now she is desperate for any job that will help support her terminally ill grandmother and rebellious younger sister. When she finds herself in the running for a slot on a new reality TV show, she signs on the dotted line, despite her misgivings. And she’s right to have them. TLN’s Who Knows People, Baby—You? has an irresistible premise: correctly predict what the teenage cast will do in a crisis and win millions. But the network has pulled strings to make it work, using everything from 24/7 hidden cameras to life-threatening technology to flat-out rigging. Worse, every time the ratings slip, TLN ups the ante. Soon Amy is fighting for her life—on and off camera. 50-word Review: Compulsively readable, eerily plausible, Kress’ first YA novel examines a near future in which the economy has collapsed and a desperate teenager accepts a spot on a sadistic reality TV show. Writing and concept are impeccable, but characters of the stock variety (although hardscrabble heroine Amy is wonderful). Fun, recommended. 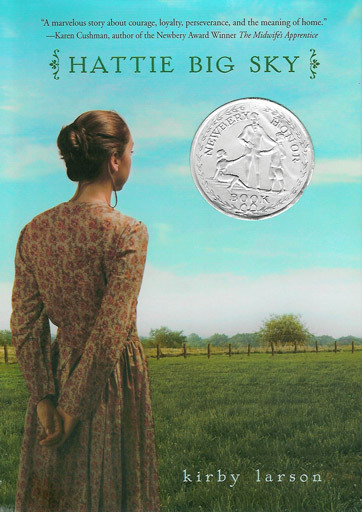 Alone in the world, teen-aged Hattie is driven to prove up on her uncle’s homesteading claim. For years, sixteen-year-old Hattie’s been shuttled between relatives. Tired of being Hattie Here-and-There, she courageously leaves Iowa to prove up on her late uncle’s homestead claim near Vida, Montana. With a stubborn stick-to-itiveness, Hattie faces frost, drought and blizzards. Despite many hardships, Hattie forges ahead, sharing her adventures with her friends–especially Charlie, fighting in France–through letters and articles for her hometown paper. Her backbreaking quest for a home is lightened by her neighbors, the Muellers. But she feels threatened by pressure to be a “Loyal” American, forbidding friendships with folks of German descent. Despite everything, Hattie’s determined to stay until a tragedy causes her to discover the true meaning of home. 50-word Review: Inspired by Lawson’s grandmother, Hattie Big Sky is a beautifully researched book telling the story of “honeyokers” (homesteaders) trying to prove up their claims in big sky country. Part epistolary novel, this book is a hopeful – yet heartbreakingly realistic – portrayal of homesteading. I cannot wait for book 2. Whether he’s rescuing prisoners, keeping his enemies from replacing him with a clone, or coming back from his own dysfunctional death, Miles gets the job done. Of course, it may not be “quite” the job his superiors wanted done. 50-word Review: Miles is back, staging a daring rescue from a Cetagandan POW camp. Miles is at his best (talking his way into/out of trouble), life in Dagoola IV’s top security prison is horrifically real, and the impossible rescue is…amazing. In short, “Borders” is one of the best novellas I’ve ever read. Final Thoughts: Like Ana, I think I’m getting the hang of these micro-reviews – but also like Ana, I simply MUST elaborate a bit further here. Of all the books (and novella) I read, my favorites are The Boneshaker by Kate Milford and “The Borders of Infinity” by Lois McMaster Bujold. 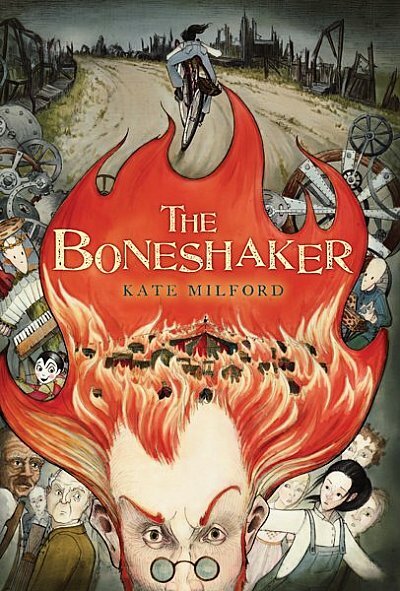 I am still flabbergasted by the fact that I had never heard of The Boneshaker or its author (especially as it was recently published in 2010!) but I am 100% on the Kate Milford train – THANK YOU, ANA! – and will do whatever I can to get this wonderful book read as widely as possible. Miles Vorkosigan is, of course, already incredibly well known and loved, and “Borders of Infinity” has given me a brilliant (crazy?) idea. In 2012, I resolve to catch up with ALL of the Vorkosigan books, including a re-read (with Ana, so I can make her read these already) of Cordelia’s Honor (that is, Shards of Honor, “Aftermaths” and Barrayar). The other three books were fantastic, too; I lucked out and started 2013 with 5 amazing picks. Cracked up to Be is a gritty, exhausting read, but one I’m glad I’ve read; Flash Point is a book I basically inhaled on my plane ride from California to New York because it is THAT snappily written and compulsively unputdownable. And Hattie Big Sky is a beautiful, honest and plain accounting of a sixteen year old girl’s dream to find and build a home – even in the face of incredible hardship. All in all, an awesome way to end 2012 and start 2013. Sounds like some good books! 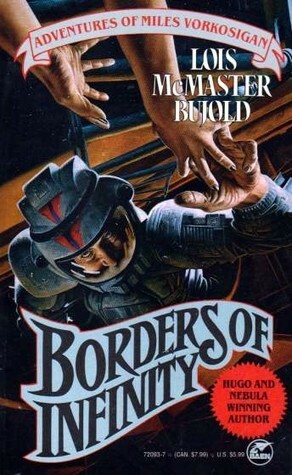 “Borders of Infinity” is wonderful; I remember enjoying that one a lot. I also need to catch up on the Vorkosigan series. There are still 4 I haven’t read, plus a novella in one of the omnibus editions I have, and that’s not including the new book about Ivan. 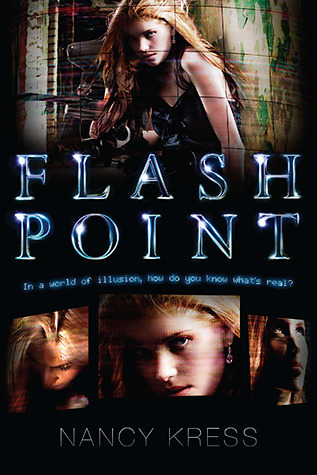 Flash Point sounds like fun; I’m glad to hear you liked it since I was curious about that one. I tend to like books by Nancy Kress, though. Her Beggars trilogy is one of my husbands favorites, and the first science fiction book I read was his battered copy of Beggars In Spain. I’ve tried to post this comment without success. Maybe it’s the links, so I won’t include them this time just in case the system thinks I’m sending SPAM. Yay, Thea (and Ana), on the The Boneshaker love! I’ve been fascinated by the crossroads folklore for quite a while and love how Kate Milford explores it in her books, along with other American folklore and history. This book has fabulous characters (main and secondary), perfect setting (a creepy carnival, which is my literary catnip), and a wonderfully evil villain who gives you goosebumps. Thea, you’re in luck and don’t have to wait for more ’cause Kate has a novella out, The Kairos Mechanism that also takes place in Arcane and features Natalie. I haven’t read it yet but it’s one of my top anticipated reads. Her new novel, The Broken Lands also came out this year and it’s just as fabulous. New characters and location but there are some guest appearances from some of the folks in The Boneshaker. I think you’ll love Sam and Jin just as much as Natalie. If you want to know more about the snake oil “patent” medicines and the Jake Leg or Jake Walk scandal check out (1) Betsy Bird’s (Fuse 8) review of The Boneshaker; and (2) Kate Milford’s website for more information and resources. It’s fascinating. This year I overcame an unreasonable reluctance and finally read Hattie Big Sky and have to say I really enjoyed it. I particularly liked how Kirby Lawson didn’t romanticize the homesteader experience but created a balanced view of the good and bad. I really liked how she explored the treatment of German Americans during WWI, something that is relevant today. I’m looking forward to the sequel, Hattie Ever After, which comes out next month in the U.S.
Oops, that’s supposed to read Fuse 8 (Betsy’s website) and not a smiley face. Apologies for that.